I'm 26, and I don't know how to ride or drive. There I've confessed (now my shoulders feel light). What a shame right? For all my life, I've been piggy-backing on someone else to get me from point A to point B. So much dependence. Sheesh Hanisha! My sister 8 years my junior took to the wheel before me (shame again, I know...I know!). I'm the only one left out of my four siblings who doesn't who the C of a car or a b of a bike. But don't judge me...I've tried learning both, a two and a four wheeler - a two wheeler in college when all I could manage was riding on the straight empty roads, but having my heart in my mouth on the turns; a car when I was in school, where for two days I'd just drive it in the compound round and round in circles, with a nervous-wreck of a driver sitting beside me. But I never saw through either. Both trainings ended abruptly and my heart wasn't in it either. But the auto fraternity doesn't get to take away full credit for me feeling the urge to learn to ride. 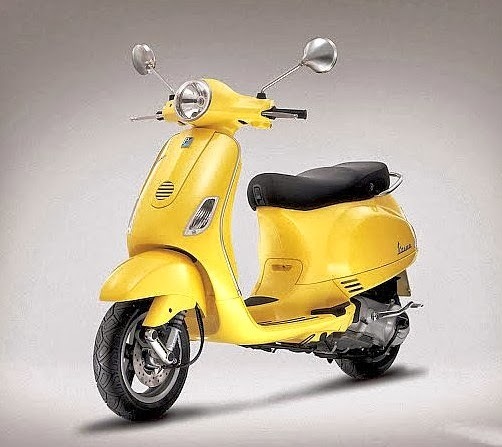 The Vespa. That's right, the Vespa. That beautiful metallic machine in all its glorious colours caught my fancy. I could just picture it - petite me zipping away on my yellow two wheeler in Paris..uh I mean in Pune. Next thing I knew, I was Justdial-ling driving schools and enquiring about female trainers. In two days of making up my mind, I found myself learning how to balance on my loud-mouth trainer's rickety, rusty ol' scooty. Three classes down and training isn't going well. I'm scared as hell. And my trainer's not helpful in the least! What's more, my visit to the Vespa showroom was disappointing. That sleek-looking two wheeler is not sleek - it weighs 140 kgs (more than twice my weight) and my feet can barely touch the ground! Vespa dreams down the drain. Anyhoo, other options are being explored. I hope to be the proud owner of one in a few weeks and say hello if you spot me riding by!